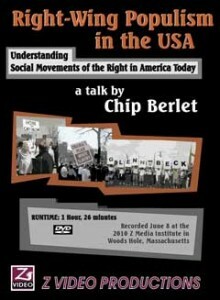 In this talk from ZMI 2010, Berlet offers an in-depth description of the rise of the far right over the last 50 years, from an ostracized John Birch Society fringe element in the 1960s to today’s Tea Party “patriots.” Using an organizing model based on previously successful left campaigns and tactics, and aided by well-funded foundations and strategic coalition-building in the 1970s, Berlet argues passionately that this self-professed “moral majority” should be taken seriously and engaged while we also fight back and defend vulnerable communities. An investigative journalist and researcher, Chip Berlet has spent over 25 years studying the political movements of the far right. He is co-author of the book Right-Wing Populism in America: Too Close for Comfort and editor of the collection Eyes Right! Challenging the Right Wing Backlash. A senior analyst at Political Research Associates (PRA) and a vice-president of Defending Dissent, the views expressed here are his own. Recorded June 8, 2010 in Woods Hole, Massachusetts. DVD includes talk (86 minutes) and extra Q&A on activism (6 minutes).